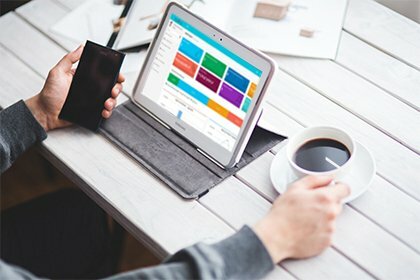 Request for demo and let's get started with BZDesk. We may ask you to provide personal information when you visit our Site, use our products, register for a program or service, subscribe to a newsletter, respond to a survey, fill out a form, or in connection with other activities, services, features or resources we make available to you from time to time. We may ask you for: your name, title or position, email address, mailing address, phone number, financial information, and other personal information as appropriate. Additionally, we may request information about the Aparajayah products you use, or third-party products connected to your BZDesk Instance(s). In the case of a technical issue, we may also collect information relating to a support or service incident. Please note that we do not intentionally collect any sensitive personal information relating to confidential medical facts, racial or ethnic origins, political or religious beliefs or sexuality; please do provide any of this type of information to us. To measure and improve the performance of our Site, we may collect information during your visit to the Site through our automatic data collection tools, which may include Web beacons, cookies, embedded Web links, pixel tags and other commonly used information-gathering tools. These tools help us track how users are interacting with our Site, and help us make your visit to our Site easier and more efficient by providing you with a customized experience and recognizing you when you return. BZDesk maintains its own pages on many social networking sites, and we may also collect information from you when you interact with our social networking pages. A "cookie" is a small piece of data stored on a user's device. When you visit the Site, the Site may place a "cookie" on your device which allows us to compile information about Sites usage and to recognize you when you visit the Site again. In addition, we use pixel tags "tiny graphic images " to tell us what parts of our Sites our users have visited or to measure the effectiveness of searches performed on our Site. This information can be used to enhance the content of the Site and make your experience more informative. Pixel tags also enable us to send email messages in a format that users can read and tell us whether emails have been opened to help assure that we're only sending messages that are of interest to our users. If you subsequently provide us with your personal information, such as your email address, we will associate our cookies and tags with that information and you will no longer be an anonymous visitor to the Site. Like many other companies, we use third party partners to analyse data collected about your browsing behaviour when you visit our Site. Our Site may include technology from Google Analytics and other similar technologies. These tools provide us with analytical information, reports and analysis about the use of our Sites, and may record the internet protocol (IP) address used to connect your device to the Internet, the type of device and operating system you are using, your general geographic information, as well as events that occur within our Site, such as the page that led you to our Site, how often you visit pages within our Site and other data related to the use of our Site. We may also use these tools to help serve content that is relevant to you. For more information about these services and the related privacy policies and options available to you, please visit the websites of our analytics service providers listed above. If you wish to avoid the Site's use of these analytics services on our Sites, you may use any opt-out mechanisms provided by our analytics providers and/or actively manage the settings on your browser or mobile device to delete and disable cookies and other tracking/recording tools. Information Collected through our Products when you install our systems in your premises, we receive information that you or your installer inputs into your configuration which may include: the model and serial numbers of the BZDesk products installed; the version and type of any software installed; the type of third-party services you integrate; geo-coordinates; your zip code or time zone; and other information about your configuration. Some of our products also allow us to automatically receive data related to the functionality and use of the system, such as the time, frequency and type of use of the various components your system, a history of your device settings including any adjustments made, data from any sensors built into the BZDesk system or the products you integrate into the system, etc. This project--specific data may be stored along with any account information you provide when you set up an account with the Site including your email and other contact information. We use this information to help us customize our communications to you, troubleshoot problems with your system or account, and to improve the functionality of our products and help make your life more comfortable and secure. To improve customer service and respond to requests. Information you provide helps us respond to your service requests and support needs more efficiently, and enables us to contact you in response to your requests for product information and support. To run promotions, contests, surveys or other features. To conduct market research about our users, improve our marketing campaigns, content on our Sites, and display personalized ads to you on the internet. To contact you by telephone to discuss your account or respond to requests and questions. To send you periodic emails. We may use email addresses provided to us to send information and updates pertaining to accounts, purchases, or products. It may also be used to respond to inquiries, questions, and/or other requests. If you decide to opt-in to our mailing list, you will also receive emails that may include company news, newsletters, surveys, updates, related product or service information, and the like. For other purposes when we have your consent. We may also use information in the aggregate to understand how our visitors and customers as a group use the resources provided on our Sites and improve our products. We may also share aggregated, non-personally identifiable information publicly and with our partners. We take steps to keep this non-personal information from being associated with you and we require our partners to do the same. At various locations on our Site or social media pages, you have the option to opt-in to receiving general communications from BZDesk. If you opt-in, you may change your mind at any time and tell us that you do not wish to receive these general messages by (i) sending an email to privacy@BZDesk.com, (ii) by clearly following the "unsubscribe" instructions at the bottom of any email you receive, or (iii) by contacting our privacy department at the address below to unsubscribe from specific mailing lists. Your personal information and data files are stored on Aparajayah's servers and the servers of companies we hire to provide data storage services to us. Aparajayah takes precautions including industry standard administrative, technical, and physical measures that are designed to safeguard the personal information collected from visitors and customers against loss, theft, and misuse, as well as unauthorized access, disclosure, alteration and destruction. When you enter personal information on our forms, we encrypt this data using SSL or other technologies. These technologies are designed to protect the confidentiality of your personal information when it's transmitted over the Internet. Notwithstanding all of our efforts, no security controls are 100% effective and BZDesk cannot guarantee that unauthorized third parties will never be able to defeat our security measures or use your personal information for improper purposes. In the event that your personal information under our control is compromised as a result of a breach of security, we will take reasonable steps to investigate the situation and where appropriate, notify those individuals whose information may have been compromised and take other steps in accordance with any applicable laws and regulations. Aparajayah may transfer its database, including personal information contained therein, to a third party who acquires all or substantially all of the assets or stock of Aparajayah or BZDesk whether by merger, acquisition, reorganization or otherwise. If this occurs, we will request that the purchaser continue to abide by the principles of the Privacy Statement, with respect to any data we've collected hereunder. Aparajayah may also disclose your personal information to a third party if required to do so by law or if, in good faith, Aparajayah believes that such action is necessary to: (i) comply with the law or with legal process; (ii) protect and defend Aparajayah's rights and property or prevent fraud; (iii) protect Aparajayah against abuse, misuse or unauthorized use of Aparajayah's products or services; or (iv) protect the personal safety or property of personnel, users or the public. Protecting the privacy of the very young is especially important to Aparajayah. For that reason, and in accordance with the Children's Online Privacy Protection Act, we never collect or maintain information at the Sites from those we actually know are under 13, and no part of the Sites is structured to attract anyone under 13. If you have any questions or concerns about this policy or your information, please email us at privacy@BZDesk.com. Aparajayah may, in its sole discretion and without prior notice to you, add, delete or otherwise change the provisions of these Terms by posting on the Website a version of these Terms containing such changes. You should periodically check the Website for the most current version of these Terms. If you are dissatisfied with any such changes to these Terms, your sole recourse will be to cease use of the Website. The Website may give you the ability to access content, such as videos, blog posts, social media feeds, documents or other material, controlled or provided by third parties ("Third-Party Content"). You understand and acknowledge that: (a) Third-Party Content remains the property of the applicable third parties, who have the sole right to determine your rights to use such content; (b) Aparajayah is not responsible for, and has no editorial control over, any Third-Party Content, and Aparajayah does not sponsor or endorse any such content; and (c) Aparajayah has no control over the distribution of Third-Party Content. You agree that Aparajayah will have no liability to you or to any third parties, including without limitation to anyone else who uses the BZDesk Website. You also agree BZDesk website content will not be used for illegally copy, display or otherwise make use of Third-Party Content without authorization from the appropriate rights holder or in violation of applicable law. Unauthorized copying or distribution of copyrighted or trademarks may constitute an infringement of the copyright or trademark holders' intellectual property rights. In addition, steps intended to defeat or bypass security measures designed to prevent infringement of the intellectual property rights of others may be illegal under Indian Law or comparable foreign laws. Aparajayah reserves the right to terminate your right to access. You represent and warrant to Aparajayah that: (a) you are at least eighteen (18) years of age and are competent, and have the authority, to enter into this Agreement; (b) you have provided or will provide BZDesk website with User Information that is correct and complete; (c) you will not use the Website in violation of any applicable laws, regulations, or ordinances or for any illegal or unauthorized activities; (d) you take full responsibility for the actions of anyone to whom you allow to access your account; and (e) you will never circumvent, compromise, nor attempt to circumvent or compromise any Aparajayah security measures in connection with the Website. THE WEBSITE IS PROVIDED FOR YOUR CONVENIENCE, ON AN "AS IS" AND "AS AVAILABLE" BASIS, WITHOUT WARRANTY OF ANY KIND, AND BZDeskAND ITS LICENSORS AND SUPPLIERS EXPRESSLY DISCLAIM, TO THE GREATEST EXTENT PERMISSIBLE UNDER APPLICABLE LAW, ANY AND ALL WARRANTIES AND CONDITIONS OF ANY KIND, WHETHER EXPRESS OR IMPLIED, INCLUDING, WITHOUT LIMITATION, THE WARRANTIES OR CONDITIONS OF MERCHANTABILITY, FITNESS FOR A PARTICULAR PURPOSE, ACCURACY, AND NON-INFRINGEMENT. Copyright 2010-2016 BZDesk Limited. All rights reserved. All trademarks, logos, trade names and service marks ("Marks") displayed on the Website or the Services are the property of Aparajayah or of their respective holders. You are not permitted to use any of the Marks without the applicable prior written consent of Aparajayah or such respective holders. Aparajayah reserves the right to alter product and services offerings, specifications, and pricing at any time without notice, and is not responsible for typographical or graphical errors that may appear in this or in related documents. Automates your sales documentation process. Empowers your sales team with powerful tools to improve their efficiency. Allow the team to create all sales documents through just a few clicks! Keep a single shared customer profile. Get all available details on leads, customers, deals, products, quotations and more. Fully automated and streamlined workflow to help you generate accurate costing, quotations, purchase orders and invoices. Create, deliver and analyze all your documents from your favourite devices, be it a Desktop or a Tablet or a Smartphone. You no longer require multitudes of spreadsheets, price lists and documents to get any information that you need. Your entire team gets into an organized workflow, delivering documents that are standard and compliant across the organization. Be it your existing workforce or your new employees, all the information they need is readily available in just a few clicks. Complete information about thousands of products and services you offer, managed from a single interface. 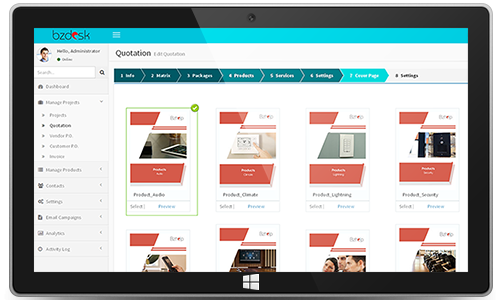 Quick look-up of products, model numbers, product images, pricing and data sheets in just a click. You no longer require hundreds of spreadsheets for each brand you deal with. Price Lists, Bill of Materials, Purchase Orders, Work Orders and Invoices get generated automatically based on few inputs you entered. All the documents saved and organized in just one place and be shared across the organization. No more manual errors and everything complies with the standards you set. Organize and manage contact information of your customers, vendors, partners and employees. Your team no longer depends on you for information or status of various contacts. Role based dashboards with a bird’s eye view for top management and detailed view for managers. Detailed reports encompassing entire operations of a system integrator offering actionable intelligence to take better and faster decisions. 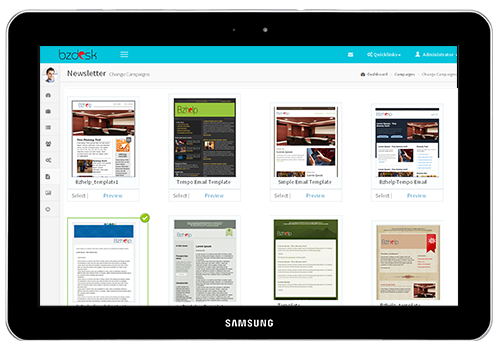 Integrated with an email campaign module that enables you to send automated emails to all your contacts. Be it a sales campaign or an offer; a season greeting or a notification; emails can be triggered effortlessly. Growing customer base implies loads of new features in store. Stay on top of your operations and sales. 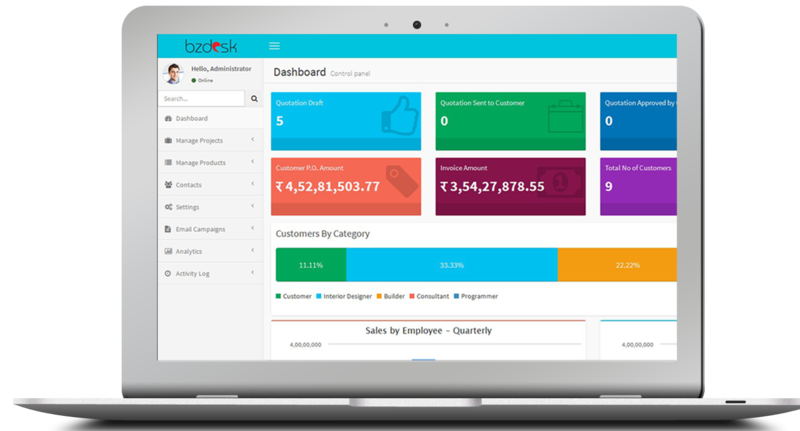 Request a demo today and get started with BZDesk. ©2015 Bzdesk . All Rights Reserved.